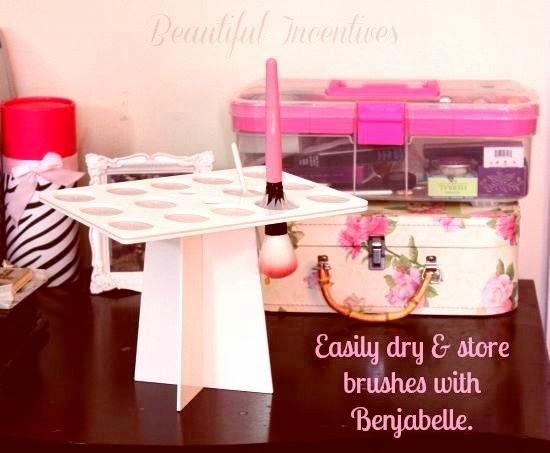 Beautiful Incentives: Dry and store your cosmetic brushes easily- with Benjabelle! Dry and store your cosmetic brushes easily- with Benjabelle! Introducing the Benjabelle tree, your heaven sent answer to brush drying. 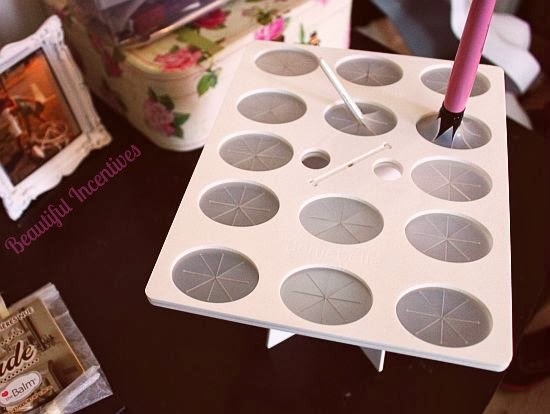 Finally, a couple of genius self starters created a contraption so simple yet so incredibly convenient to store our makeup brushes. Gone are the times of fumbling with brushes to dry them at just the right angle. The time where they take forever to dry and or don't dry completely at all. No more wasting paper towels or using convoluted schemes to dry them. Rubber bands with clothing pins on clothing hangers anyone? Yeah, i've been there! You can say good bye to all of that. The tacky times are behind us with the Benjabelle by our side. As you can see, the Benjabelle tree is not even remotely unsightly. In fact, it's a very unique looking design that I am proud to display on my makeup table. It adds a lot of character to my old bland set up. The Benjabelle holds every size brush imaginable with its soft yet firm plastic grips. 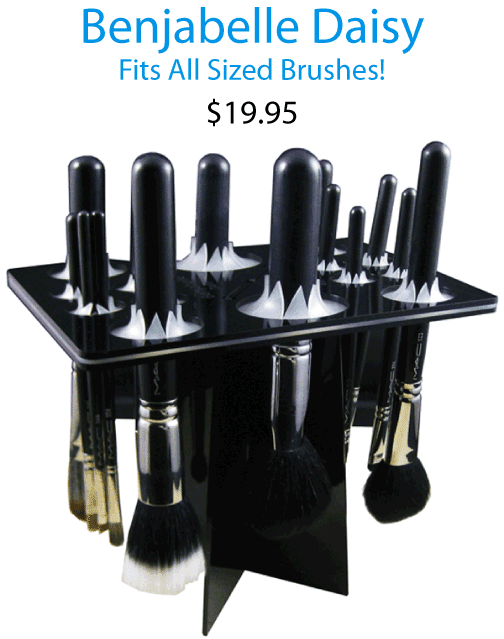 There is also a smaller version you can get just for your smaller brushes or a variety version for big and small. I received the regular one for review and used it for both sizes just fine. Not ideal for the small ones, but it works! Eventually I'll have to upgrade to the Daisy variety tree. This beauty holds everything nice and secure and most importantly the bristles of the brush are facing down, which is important for complete dryness AND preventing the bristles from fraying, getting damaged and drying the wrong way. The thing I love most about this is that it keeps the clutter of my brushes obsolete and gives me tons more room for other things I need to put on my makeup table and sink. For just $35 this is a wonderful investment if you use makeup brushes on the daily. We all know in order to keep those suckers germ free, you need to wash them every week at least. The Benjabelle makes it a lot more fun and easy to do so! The Daisy variety tree is only $20 as opposed to the $35 for the regular tree. In my humble opinion, BOTH are worth the cost! What I love most about this company is that not only do they sell a nifty thing like this, but they sell it with FREE shipping inside the US! If you'd like to hear more and keep up with promotions, visit their social media. They are always updating!